Diving in Fernando do Noronha. The island of Fernando de Noronha is one of the world's most prestigious diving paradises. Our Noronha experts will get you connected with Diving Stoppings in the Brazilian island. Fernando de Noronha is considered one of the best places to scuba dive on the continent. There are also quite a few diving schools so travelers can learn to scuba dive while visiting the islands. Visibility in the ocean is best in winter from April through November with averages up to 120 feet. During the summer from December through March the visibility can drop to 50 feet. There are areas to conduct deep underwater dives such as Cagarras Fundas or Ponta de Macaxeira as well as areas for shallow diving such as Resurreta or Ilha do Meio. The water temperature averages 80 degrees F throughout the year. Divers can feel comfortable wearing 3 mm short dive suits or the full suit too. There is quite a bit of exciting sea life that divers can enjoy. Spinner Dolphins are at home in these waters as are the numerous sea turtles. Sharks and Manta Rays also make an occasional appearance. During a day of diving, travelers can expect to see spotted eagle rays, green moray eels, stingrays, spiny lobsters and gigantic nurse sharks. While the coral is not too bright the tropical fish more than make up for it as they are quite large and very colorful. There are three large dive shops on the island and all offer diving instructions. Aguas Claras has been operating since 1985. This shop is the only PADI 5 star Gold Palm Instructor Development Center. 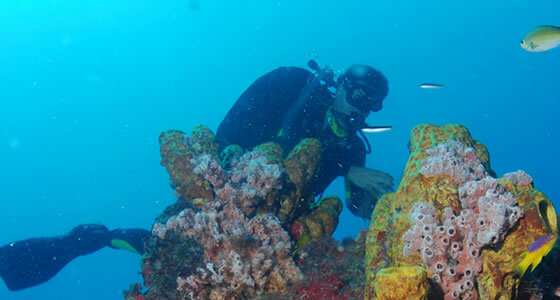 It is also the largest scuba diving operation on Fernando do Noronha. Divers have the option of heading out to dive sites on a traditional boat or a high-speed military inflatable vessel. Atlantis Diver set up shop in 1994. The guides are quite fluent in English and they have 2 catamarans and a smaller boat. Noronha Divers is a NAUI Gold Scuba Center. Their facility has been running since 1995 and they have custom made diving boats that can hold up to 40 to 50 divers. There are 20 dive sites under 100 feet for divers to choose from. Buraco do Caracao is in a calmer portion of the ocean and perfect for beginners. The bottom is quite rocky and divers can expect to see many different sponges as well as turtles, tropical fish and nurse sharks. Buraco das Cabras is considered a very colorful area. Divers can drift with the current past Rata and Meio islands. The rocks look like ancient ruins and divers can expect to see barracudas, hammerhead sharks, manta rays, queen angelfish, basking sharks, manta rays, lobster, octopus and manta rays. Cabeco da Sapata is a dive around an underwater mountain. Divers are sure to see horse-eyed jacks, triggerfish, chromis and grunts. The currents are quite fierce and large sharks and turtles are common encounters. This site is for experienced divers. Cagarras Fundas is a vertical wall dive. Sponges have congregated here and several different reef fish are visible including Queen Angelfish, Gray Angelfish and Rock Beauty Angelfish. Manta Rays and Sting Rays are often seen feeding on the bottom.